Note: Knife is not included. Custom designed medium leather knife sheath with a small metal belt clip. Although I do not personally trust this small clip for belt carry away from home, it does have it's place and many uses. Works great for inside pocket carry, purses, backpacks, work bench, car doors with pockets, ect. Clip helps keep your knife in up right position and easy to get a hold of quickly. Also fine for belt carry around the yard, shop, garden, ect. Clip is riveted and stitched to sheath for holding up to hard use. Features: Premium carving leather with grass border tooling, recessed hand stitching and hand rubbed finished edges in Saddle Tan, Chocolate Brown, Black (shown), Mahogany, Natural Leather with natural edging, or Natural Leather with Black edging. A color chart can be found by scrolling through the photo's. You should contact me so I can help you determine clip position if your purchasing for inside front pocket carry. Fits knives approx. 3 1/2" to 4" long X 1 1/8" wide X 1/2" thick OR 1" W X 5/8" Thick. This sheath fits Case Sod Buster Jr, Case Canoe, Medium Trappers, Buck 389, GEC Outlaw Jack, Boker Beehive, Case Sea Horse Whittler, Tinker, Spartan, and Pioneer Swiss Army Knives, and other like knives. Stitching and riveting is guaranteed for the life of the item. This item is being made as ordered and ships in 7-14 business days if not in stock. Built to last and made in the USA! 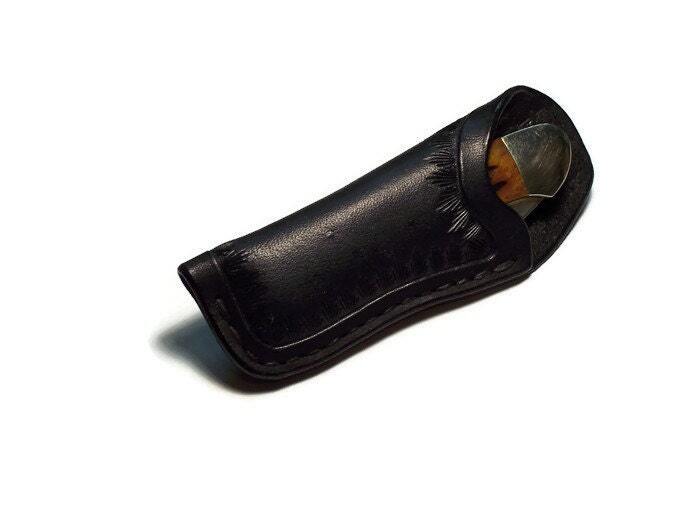 Very nice sheath, I wouldn’t hesitate to buy again. Excellent item that fits perfectly with my knife. Thank you!